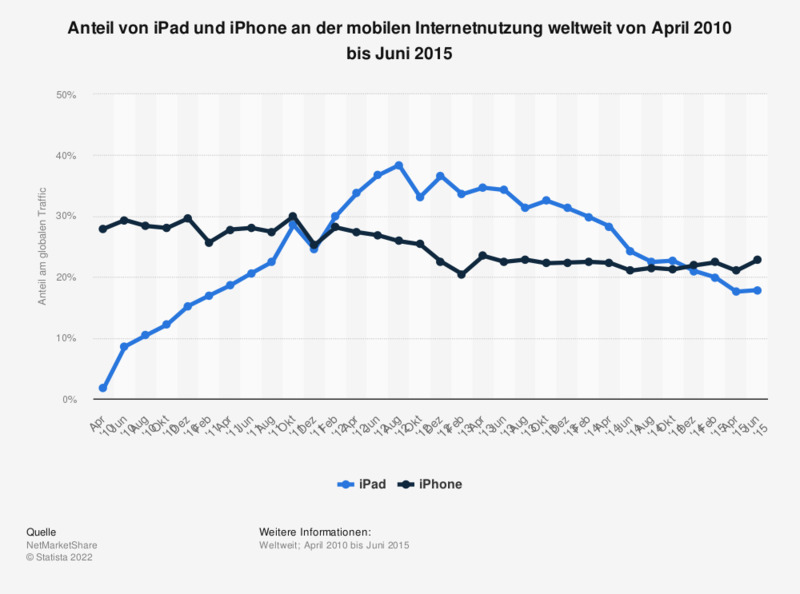 Die Statistik zeigt den Anteil von iPad und iPhone an der mobilen Internetnutzung von April 2010 bis Juni 2015. Apples Tablet-PC verusachte laut NetMarketShare im April 2014 rund 28 Prozent aller Unique Visits. Die Quelle macht folgende Anmerkung: "We 'count' unique visitors to our network sites, and only count one unique visit to each network site per day. This is part of our quality control process to prevent fraud, and ensure the most accurate portrayal of Internet usage market share. The data is compiled from approximately 160 million unique visits per month. The information published on www.netmarketshare.com is an aggregation of the data from this network of hosted website traffic statistics".